Here is a post for you all a bit out of left field, and quite a few months since I last wrote. 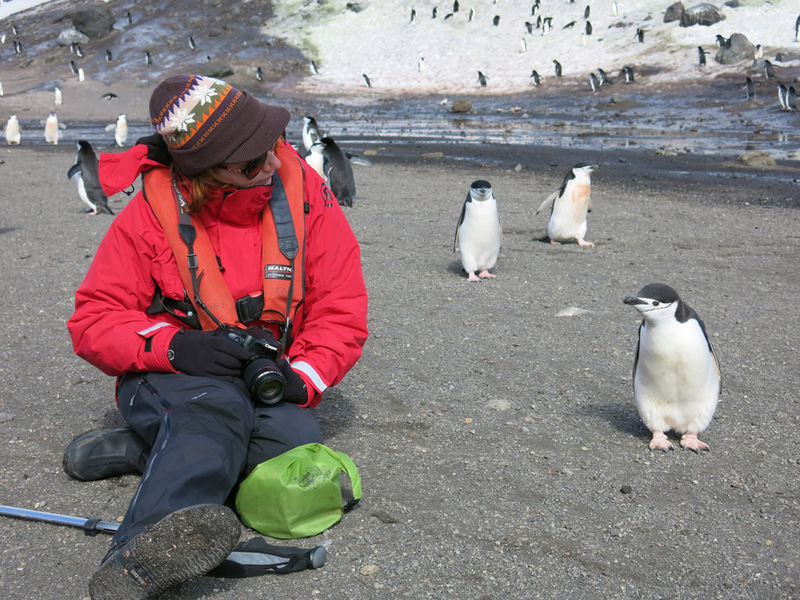 When I left you, Kate and I had returned from Antarctica with a crazy amount of stories of penguins and seals and ice and swims and whales and kayaking and things that you only dream about. 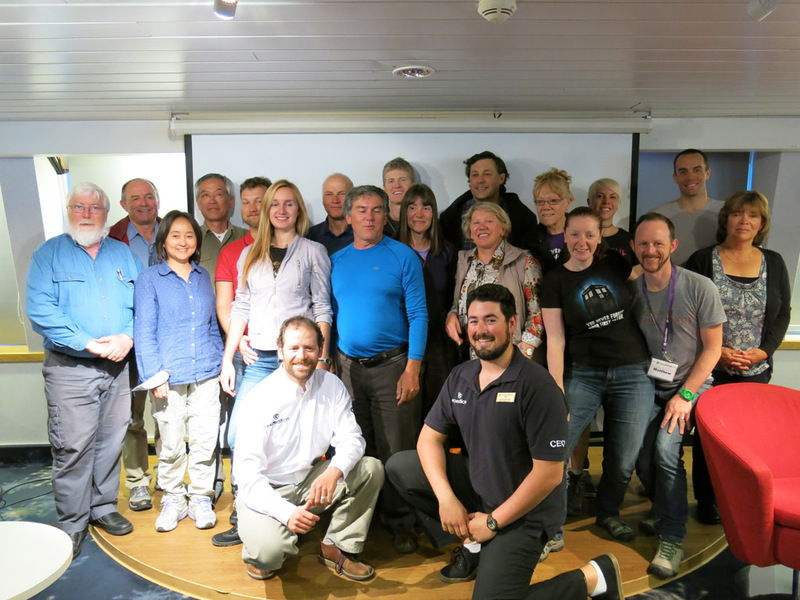 A massive part of our experience was thanks to G Adventures and the amazing crew of the MS Expedition and how much they looked after us and helped us have such an incredible time. I thought it was appropriate to write a short epilogue to let you know a little bit more about G Adventures and how they have helped make it the best honeymoon ever. 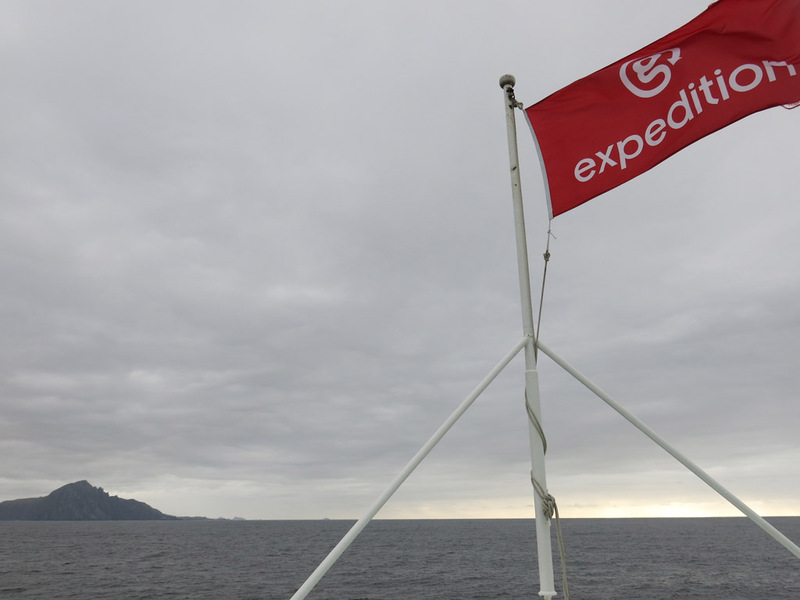 The MS Expedition, our ship that we travelled on, had two flags flying proudly during the trip. One, the ships flag, and the other a G Adventures pirate flag that Kate and I both fell in love with. Instantly we thought something like that would be an awesome memento of our trip, but put it to the back of our minds as we headed south. It was towards the end of our journey that an out of the blue opportunity to get our hands on said pirate flag emerged. During a charity auction on the boat, the pirate flag was up for grabs! We were super excited and bid hard with gusto, deciding it was meant to be. Sadly, we were continually being outbid by another passenger, and when the price went quite a bit beyond what we really wanted to pay, we called it quits. A bit of asking about the crew to try and source another flag came up empty handed. Alas, it seemed it wasn’t meant to be after all. On our return home, I decided to drop G Adventures a quick message, just to see if there was a chance of getting my hands on a flag. It was going to be a long shot, but I thought, hey why not give it a crack. So I sent a message through their website, telling my story of our trip and honeymoon, and hoping that it would get through to someone who may be able to help. But you know how it is… web contact forms don’t typically fill one with confidence. Lo and behold, a day or so later I got an email from Lyndon from G. What was I thinking when I sent my message? Of course, being G Adventures, I should have expected a reply and something amazing, and that is what I got. Lyndon loved my story and instantly sent me a photo of the EXACT right pirate flag, letting me know that he would be more than happy to send one my way. And not only that, some t-shirts for both Kate and I would be in the package as well. The email was classic G Adventures… funny, caring, and eager to help all at once. Lyndon got our tee sizes and popped his generous gift into the mail. With both Valentine’s Day and Kate’s birthday only a few weeks away, I was looking forward to the big surprise. I was going to score major brownie points! 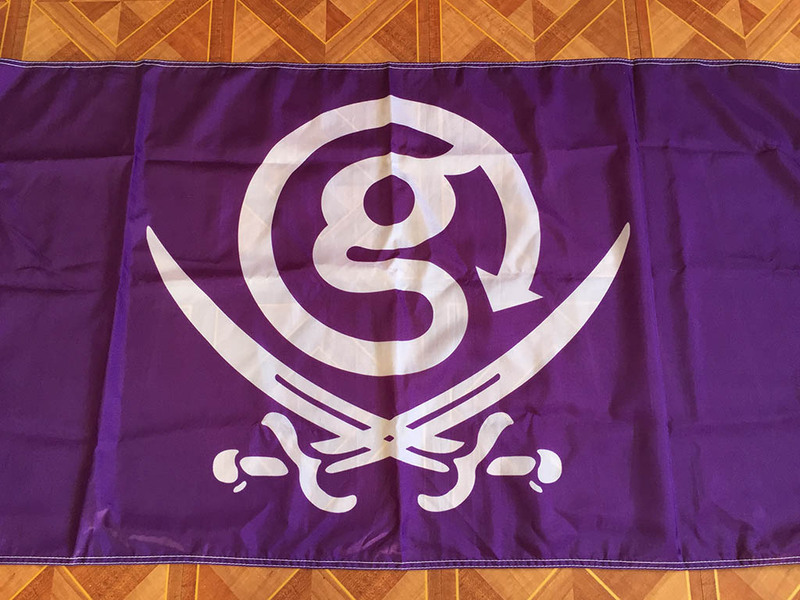 Inside was 4 tees and the best honeymoon memento we could imagine… our very own G Adventures Pirate Flag. Needless to say it is going to take pride of place in our house. We are now officially G Adventures pirates! One last post! A few people have reminded me that I said I would post a map of where we went in Antarctica. Here it is! We got it in a bundle of documents from G Adventures a week or so after the trip. They are awesome, as the docs give us all the exact details of where we went, what we did, latitudes and longitudes, water temperatures when I swam (minus 1.1 degrees celcius! )… everything we would want to know. So here you go. Hope everything makes a bit more sense now! 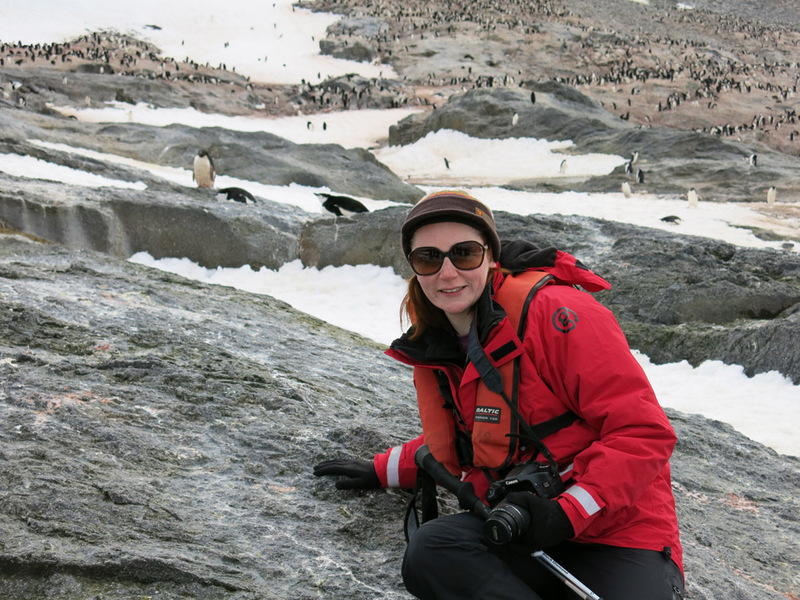 This post is just because I didn’t want my last Antarctica holiday post to be me all ranty at an airline. It really should be much more fun. So this animated gif was a request from Kate. I like it. The day kicked off with the familiar wake up call from Jonathan but nice and early. 6am to be precise. Bags were outside the cabin, and there was little left to do but have breakfast, say goodbyes, and disembark. It was strange saying goodbye to everyone, and there were hugs all round with all the staff. It does legitimately seem to mean a lot to them that they have this job and do make a connection with many of the passengers. Our flight was not until 3pm, so we had the morning in Ushuaia. There was not much to see or do that we hadn’t already, so the day was simply going from one cafe to the next to chill out. We kept bumping into both crew and other passengers which made for a strange, and almost anti-climactic end to the trip. It came time to get on our shuttle to the airport, where we were greeted with the Argentine efficiency were were seeing a bit. For a small airport, it sure was a loooooong queue. We got to the airport about 2.5 hours ahead of time, and it seemed that some of our group only just made the flight. Oh well, we were now all Buenos Aires bound. 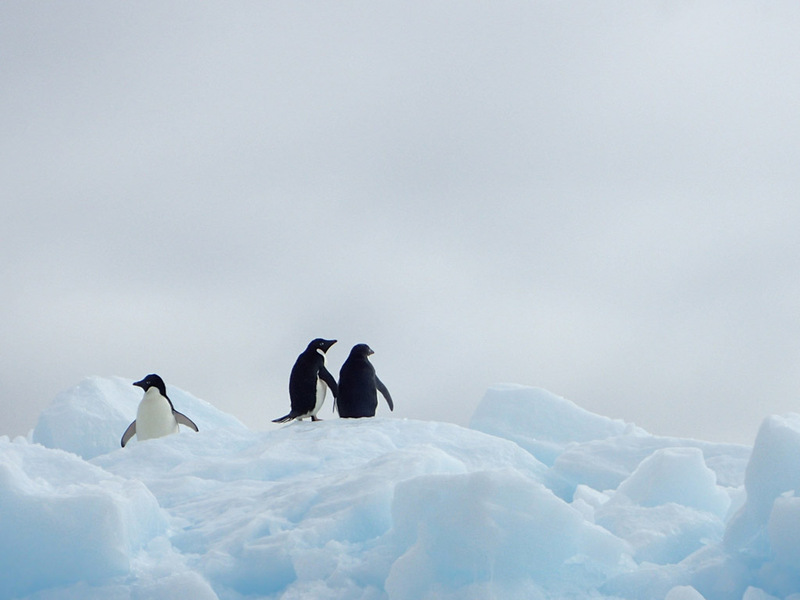 Antarctica was officially all done. Kate and I originally had dinner reservations for the night, yes another big steak dinner, but alas our flight was rescheduled while we were on the boat and pushed back a couple of hours, so sadly we couldn’t make it. Booo. Seems they are happy to change the times of flights happily enough over here. Makes planning a difficulty. So we went straight to our hotel near the airport where we were both exhausted anyway. Try to get a good nights sleep before our morning flight tomorrow to our final Argentine destination. So spoke Jonathan in an impromptu wake up call. 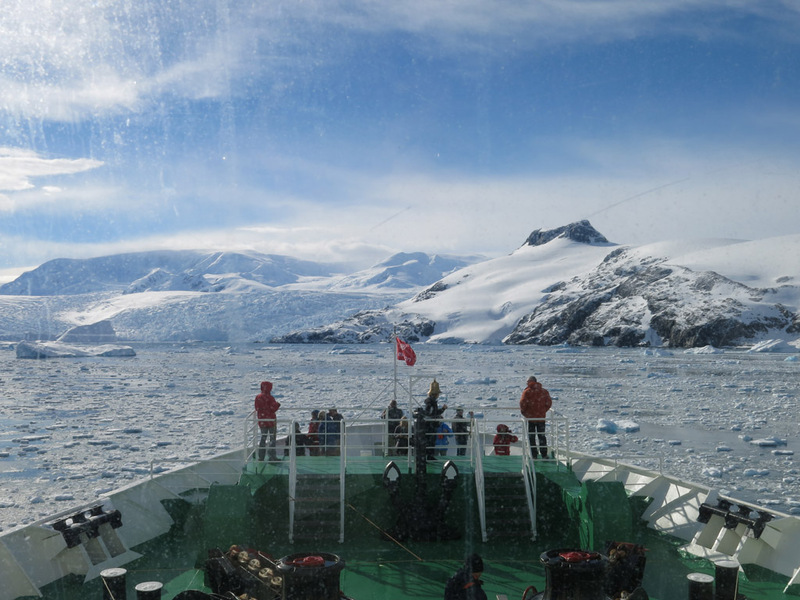 Since we had such a smooth passage over the Drake, our Captain chose a sailing path that took us much close to Cape Horn that we would ever had gone, another small reminder of the amazing captain and crew we have. It was a buzz to see the southern most continental tip, being in Chile. We actually needed Chilean permission to enter we ended up that close. All this before breakfast on a quiet sailing day, and a very distinct reminder that we were going to be back in Ushuaia later today. Today was another day of some lectures and formalities, with some farewells thrown in. First up was Scott introducing a short doco on the sailing around Cape Horn, and the life of a sailor in the 1920’s. They were all hard men. 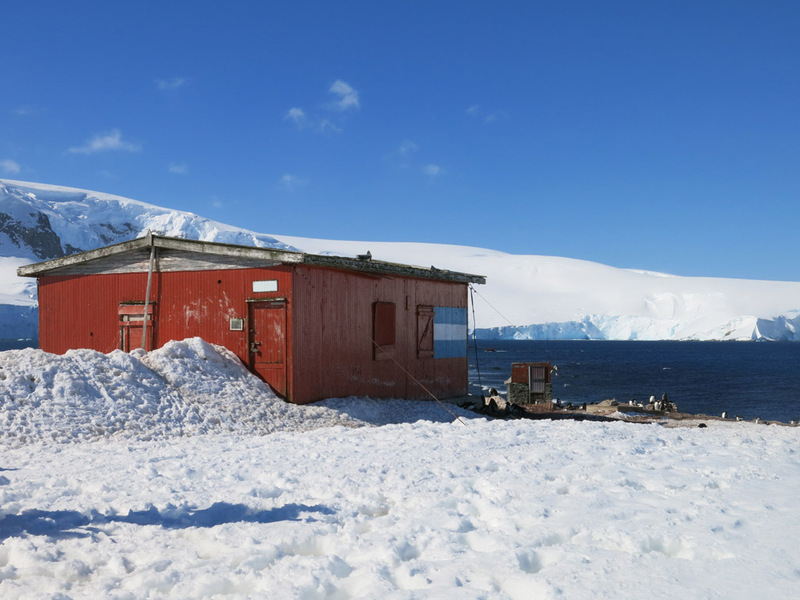 The second lecture was by Gerard, who gave us a talk on his winter in Antarctica as resident chef in one of the British Antarctic Survey stations. 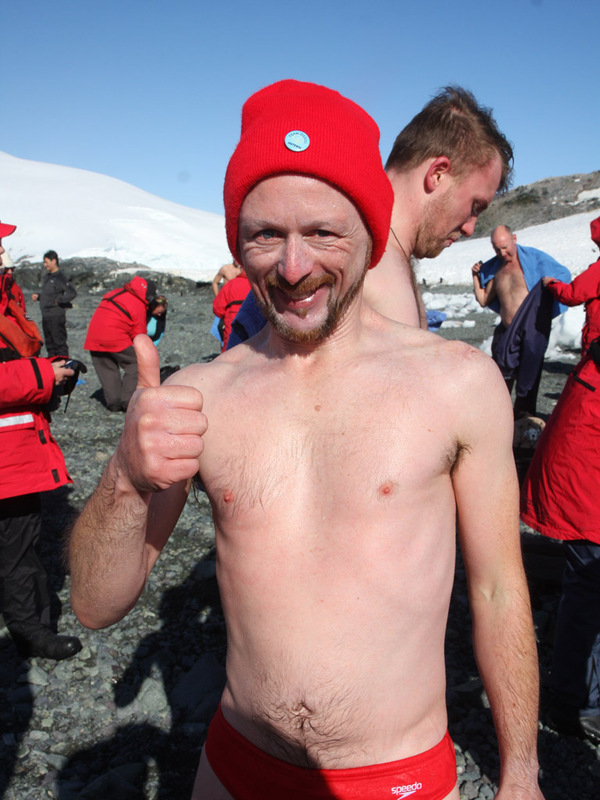 This was probably my favourite talk of the entire trip, as he told his story that was equal parts about the history of food in Antarctic expeditions, but also his experiences and how he went about feeding 14 men during an 18 month stay. It was quite incredible as he talked about the challenges of not just feeding them, but finding ways to keep their spirits up and how you stop everyone from going mad. 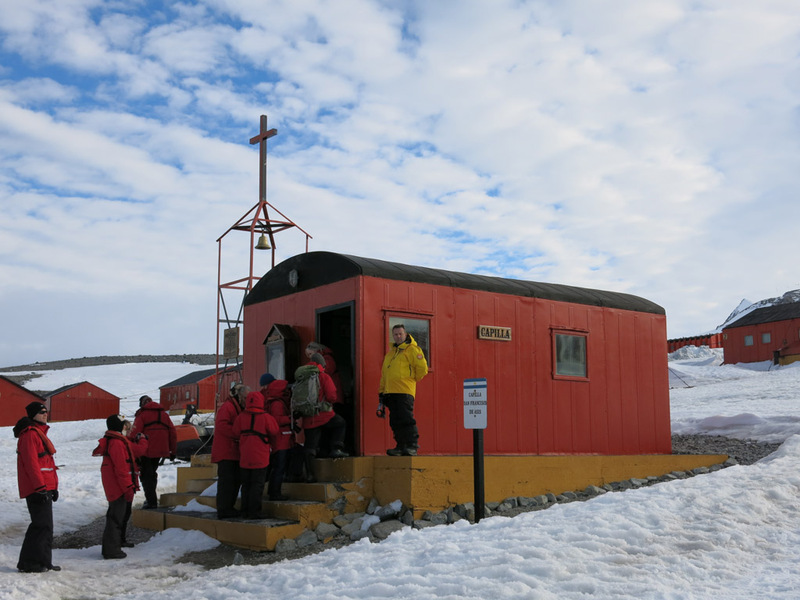 It was an amazing insight to life on these stations, and from the chefs perspective made for a riveting tale. Up next John ran a trivia session that was actually 40 pretty tough questions. We amassed a solid group, and thanks to our handy reference books (which were allowed!) 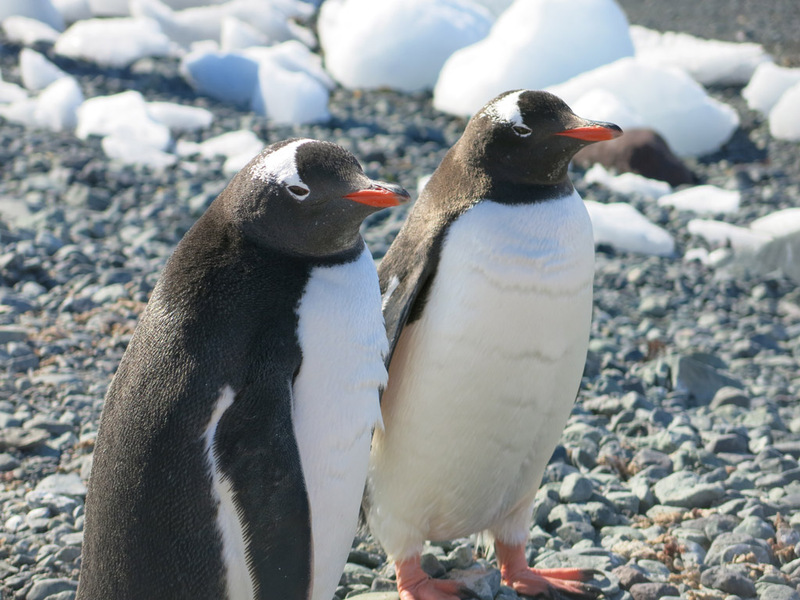 we managed to answer many an obscure question about explorers and bases and the odd easy one about penguins and whales. We ended up with 32 out of 40… a bit of a ways off the winners at 38, but we were quite proud of the achievement. The night started to get more and more sad as we had a series of formal and informal farewells. First was the formal Captains farewell, where our amazing captain visited us all to wish us Bon Voyage. He had done a stellar job navigating the ice, sending us to other places, chasing whales that I can’t imagine it would have been better. 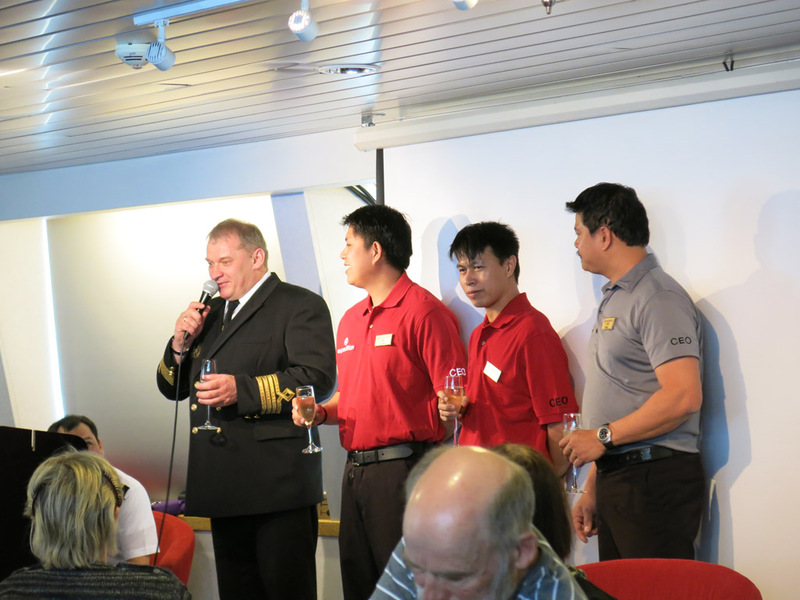 There was also a series of farewells to all the crew, including engine room, deck hands, cabin staff, cooks and everyone. They had all done an amazing job, and got a deserved ovation. Farewells to the crew happened in a less formal way, with everyone doing the rounds during dinner. Mark also called a final Kayak meeting for us all to run through photos and say a formal goodbye. We were a tight knit crew, and it was pretty sad but everyone was still buzzing from our kayaking experiences. Mark and Phil were the absolute best. All the informal farewells started happening in the Polar Bear bar, where Blaise was busting out a final set. About a third of the passengers were there and quite a few of the staff, having a final drink together. Again there were plenty of hand shakes and hugs to finish off the evening. Well, the evening finished with some bag packing for the early morning disembarkation that awaited. I woke after a solid 9 hours sleep, happy to have caught up on some hours, but still a little tired. But that was OK, as 2 days of Drake’s Passage awaited, with not much but some lectures, movies, and going through photos to pass the time. At breakfast it seemed half the boat had decided that rest and sleep was the order of the day, with the dining room only half full. But those that were up were very happy with the current state of the Drake, with calm seas outside our dining room windows. All the horror stories of rough waters were still just that… stories. The rest of the day was always going to be quiet with not much to report. A few great lectures entertained much of the boat. 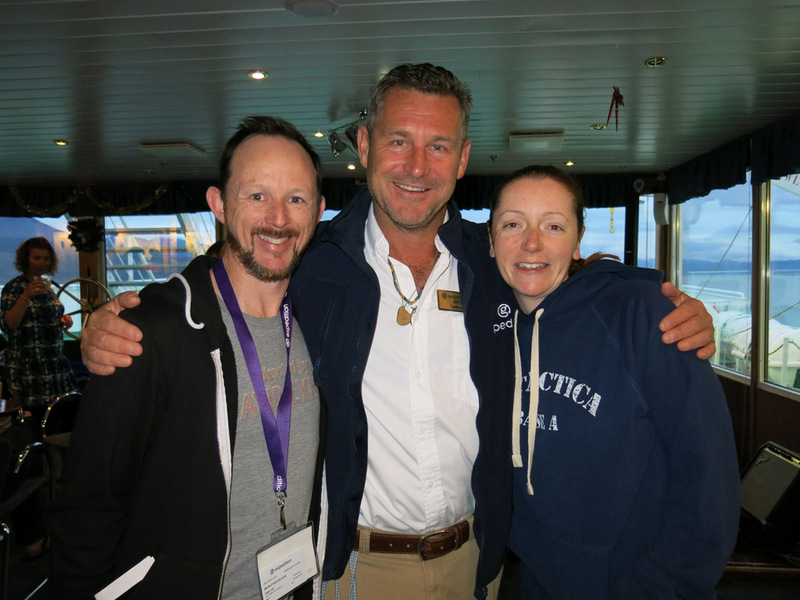 One on whales by John, glaciers and ice by Gerard, and a fascinating one about the race to the pole by Scotty. They all really knew their stuff, but Scott’s on Scott and Edmunson’s battle was amazing. It really stirred the need to read more about it. Wedged in there was also a screening of March of the Penguins. It had been a while since I had seen it and it is nice, if a bit cliche and populist. 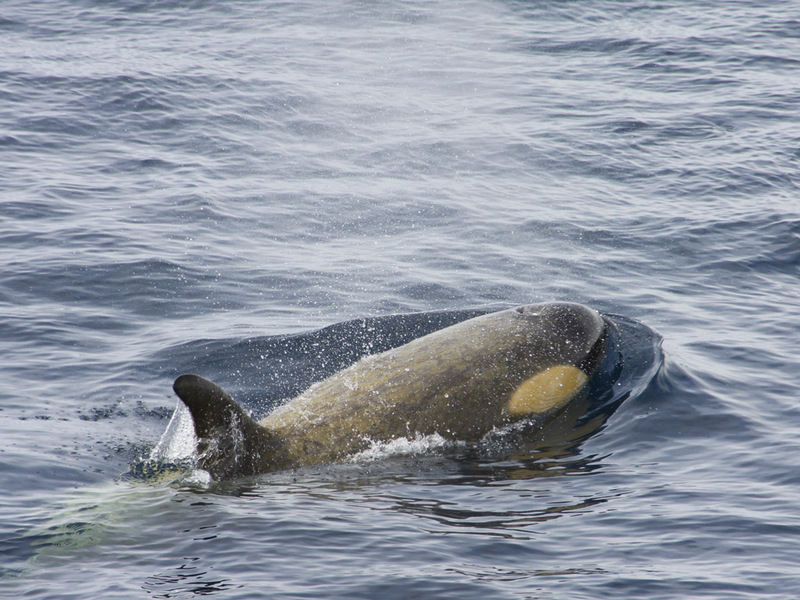 But a nice way to spend an hour and half (although a bit of an odd choice in way since we were never going to see Emperor penguins). Kind of anti-climactic huh? In a way it is the only disappointing part of the trip. Totally unavoidable, but two days of Drake after the sheer wonder of the past 8 days meant that it was difficult to not be a bit flat. But thankfully, being New Years Eve, we had that to keep us going. After dinner, the water started to get a bit rougher. Hardly Drake Passage rough though, just a bit more of a wobble and enough for Kate to feel a bit uneasy. She rested while I caught up with photos and chilled out until we got called for an impromptu kayak meeting. Mark called the meeting just to thank us for the good times and let us know about some feedback they were after and that we would all receive a certificate of accomplishment for our hard work. We also took the opportunity to share email addresses and start the process of getting some photo swap happening. 11pm arrived and it was time to visit the Polar Bear bar for some New Years shenanigans. Most the boat had made their way there and as we got closer to midnight the ships crew begin to prepare some festivities. On midnight a countdown came from the bridge. On the stroke of midnight a number of crew lit flares and shot them into the air. Happy New Year! Everyone was celebrating joyously, most of us still trying to wrap our head around the surreal nature of our new year. 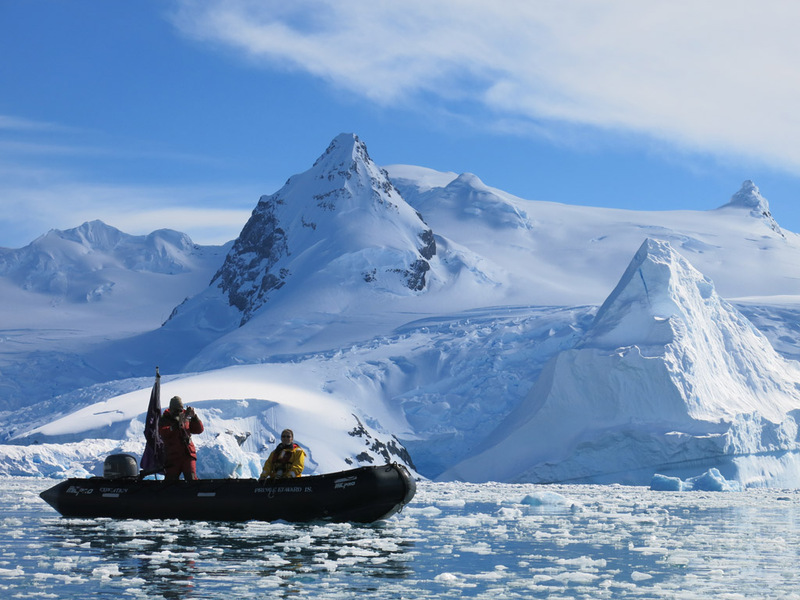 How do you top being in the Antarctic, on the back of an expedition ship, drinking champagne? The celebrations went on long into the night. I pulled the pin at about 1am, content to finally take a breather and call it a night. Happy New Year everyone… hope yours was as memorable in its own special way. See you in 2015! 6am, the familiar voice come over the speaker in our room. It’s Jonathan with his morning wake up call. “Good morning everybody” he starts and lets us know that we have an early day today as waters are calm and we can tackle some landings that are usually off limits due to touch conditions. 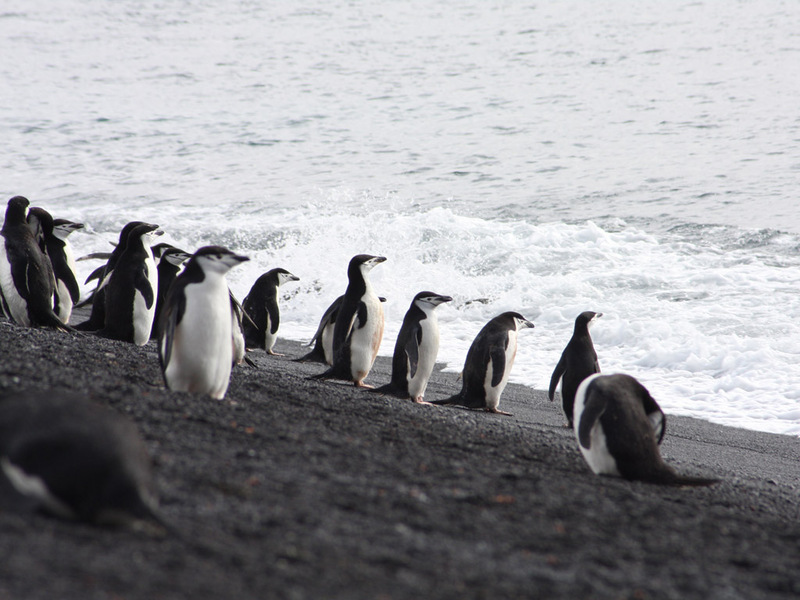 Deception Island is our destination, but lucky for us, given the conditions, we are aiming to land on a black sandy pebble beach that is home to thousands of Chinstraps. 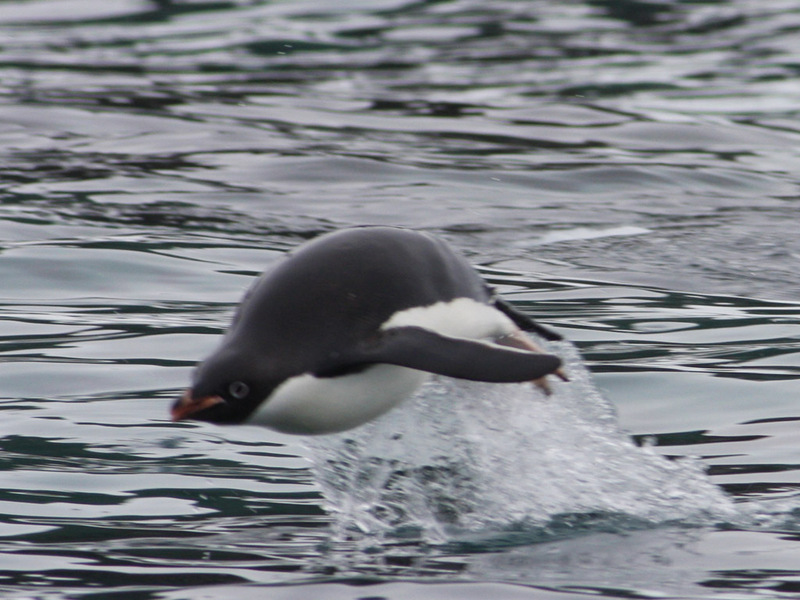 But this was very dependent on conditions as we have to do beach landings which given the waves can be tricky. But it all looked promising. Given the different landing conditions, kayaking was off this morning due to all hands needing to help out. That was OK, as everyone I spoke with was intending to head on to the beach anyway. Fingers crossed for the afternoon. 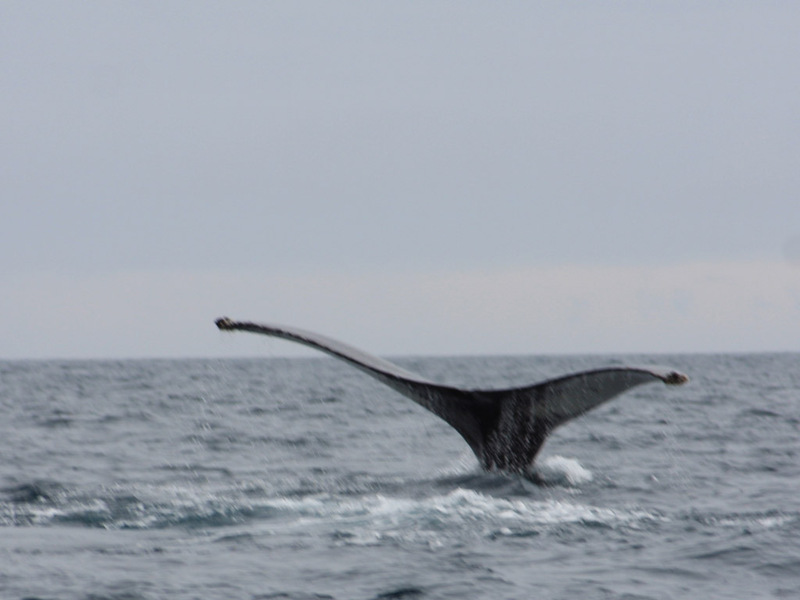 At 7:30am we were getting the call up to get on to a zodiac. With seas pretty calm, we headed on to shore and had an easy time getting on to shore. 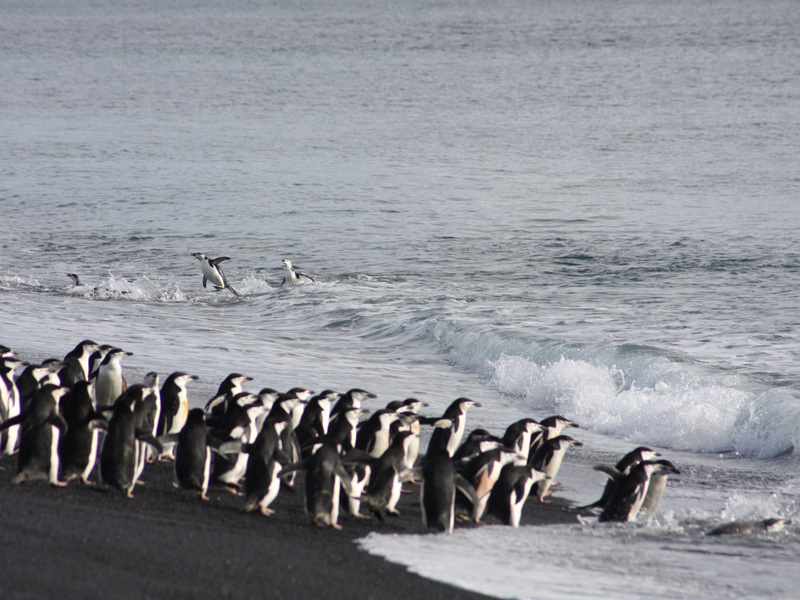 I was getting to the point where I didn’t think we would see much different, but here we were greeted with a black volcanic beach and thousands of Chinstraps heading in and out of the water. 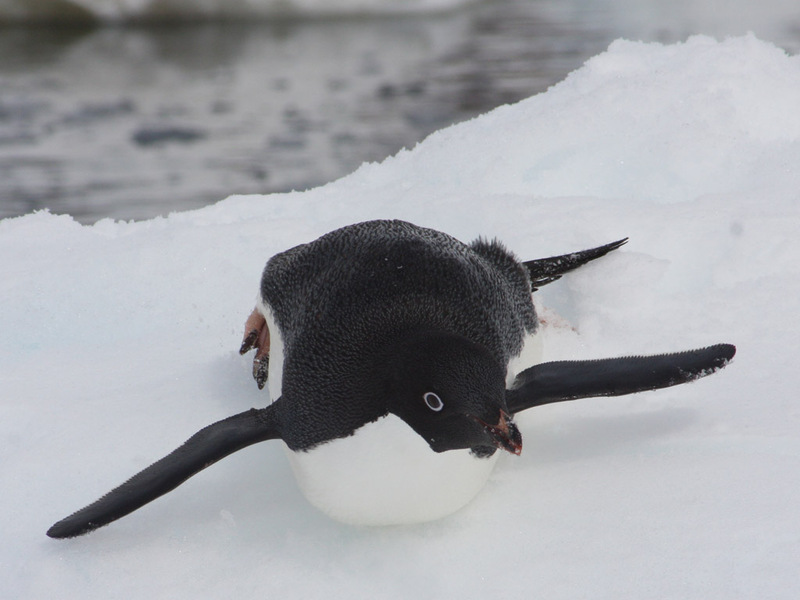 Definitely a different sight to the usual icy landings. 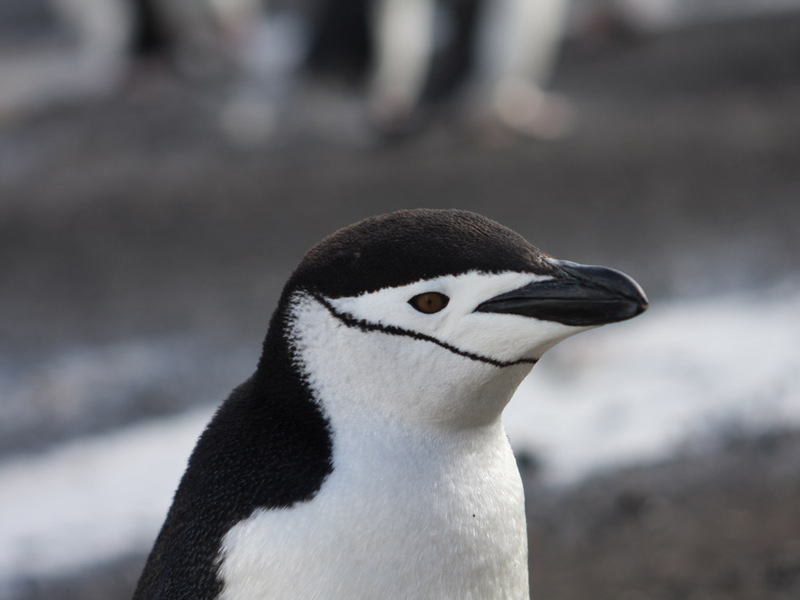 Deception Island is actually an active volcano that last erupted in 1970, so not that long ago. As such the beach is actually very similar to that of Iceland, and it had much the same feel. Except for the penguins of course. 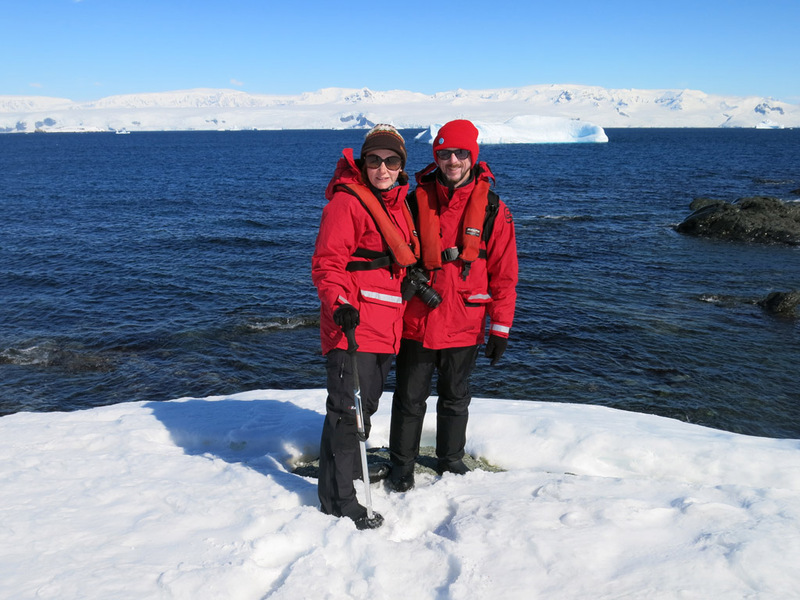 Our landing point was actually Bailey’s Head, and Jonathan, who drove us on shore, said it was only the second time he had seen it so calm and sunny. Our blessed run continued. 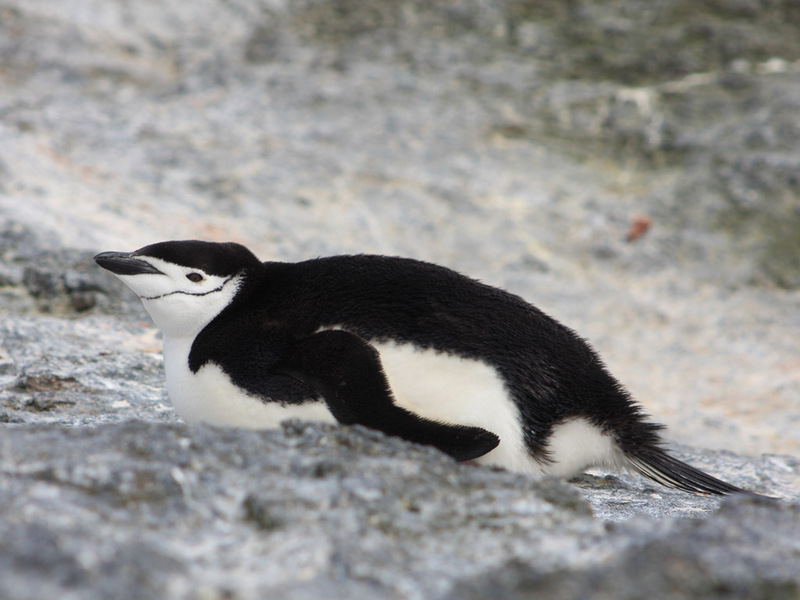 The next couple of hours were spent wandering the island and amongst the thousands of Chinstraps. 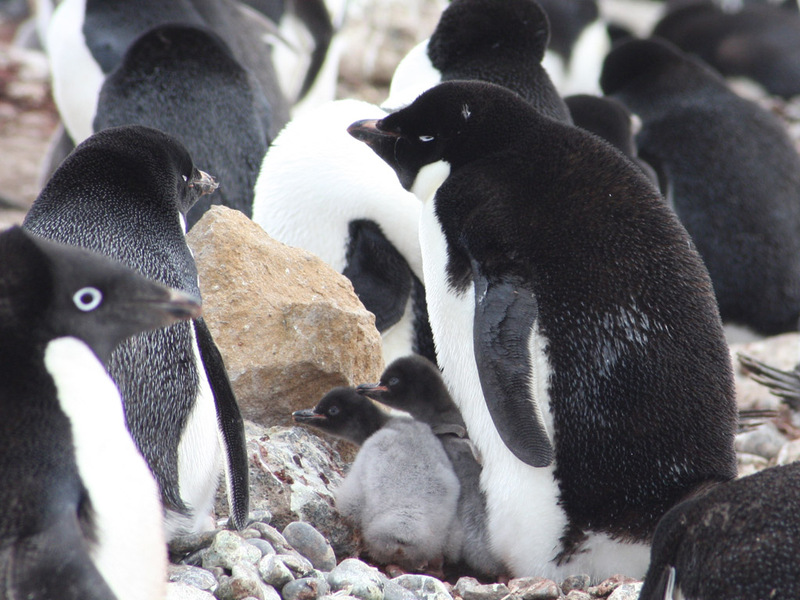 These little fellas seemed to be more curious than the other penguins. 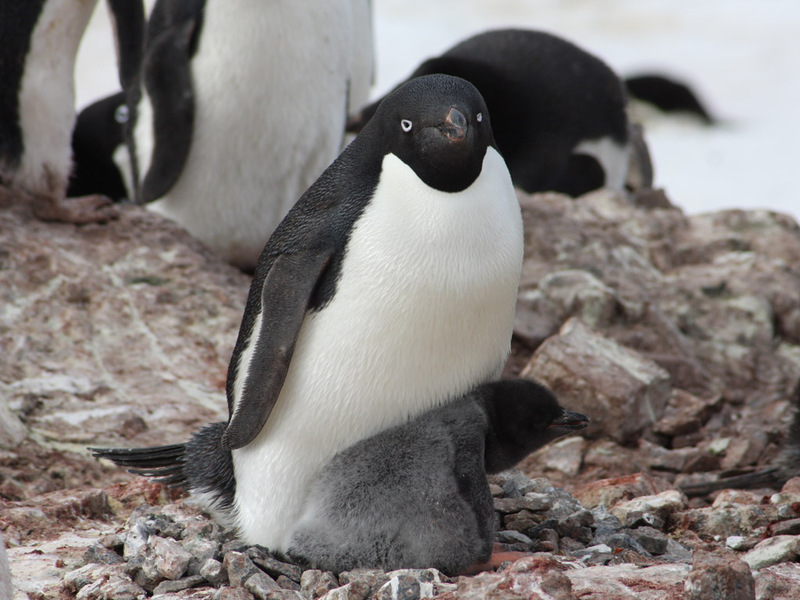 We found that if we just sat there, then the odds were good that you would have a penguin at your feet. Indeed one of the other passengers had a penguin pop up on his lap! 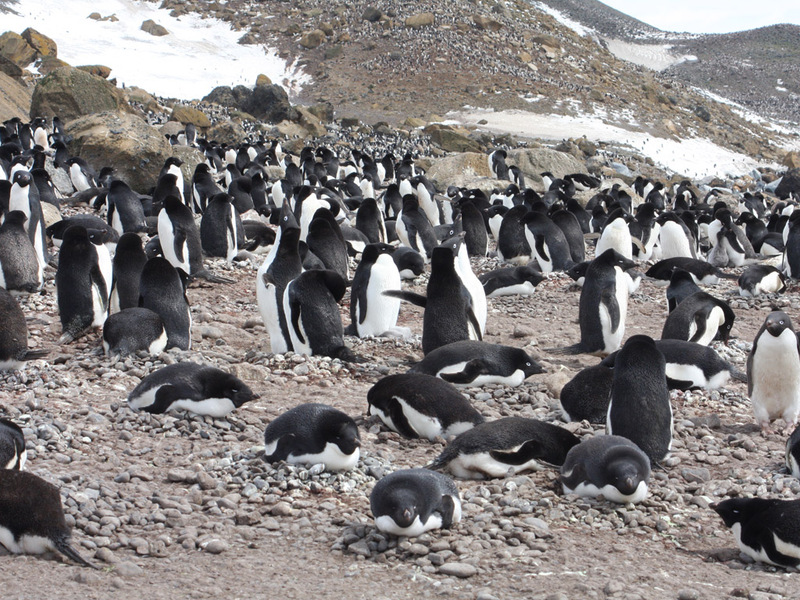 The whole beach and area we explored was a buzz of penguin activity. 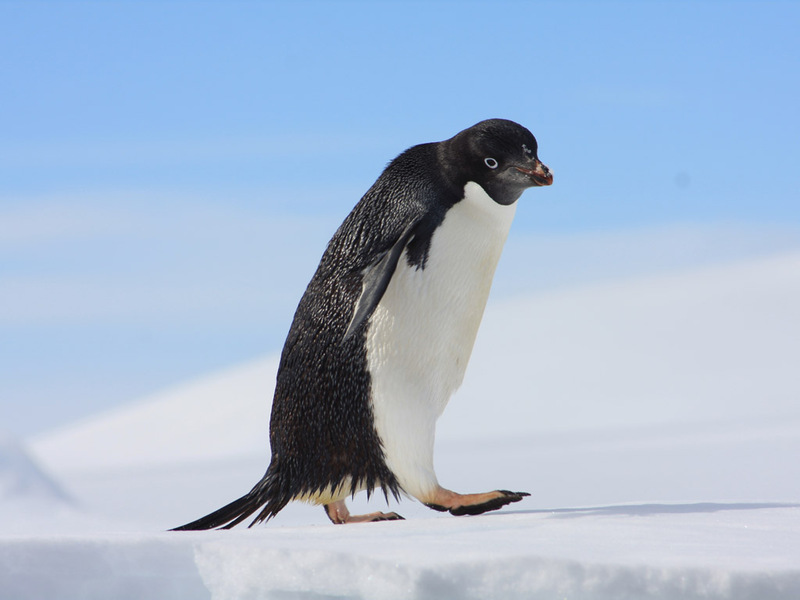 There were penguin highways, but not of the clear snowy kind we were used to. 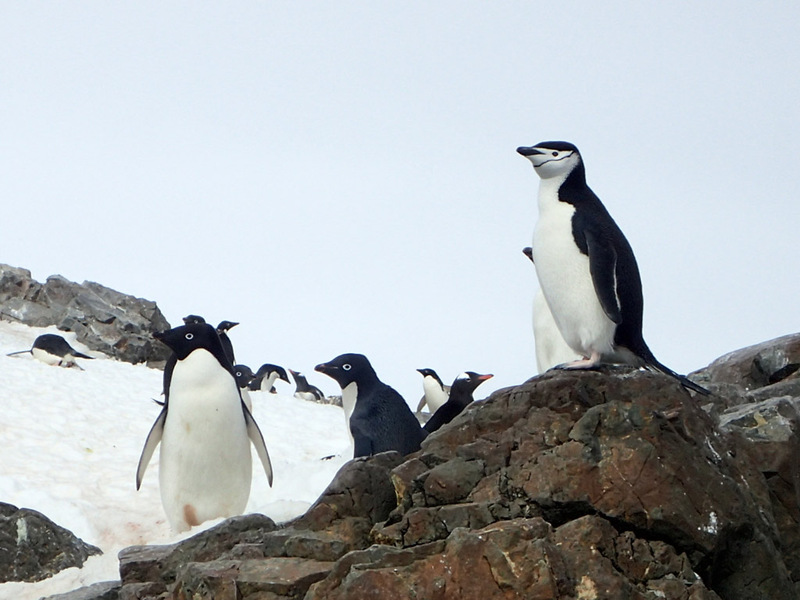 Rather there were clear lines of penguins wandering, although a little more haphazardly. All we had to do was try not to get in the way. 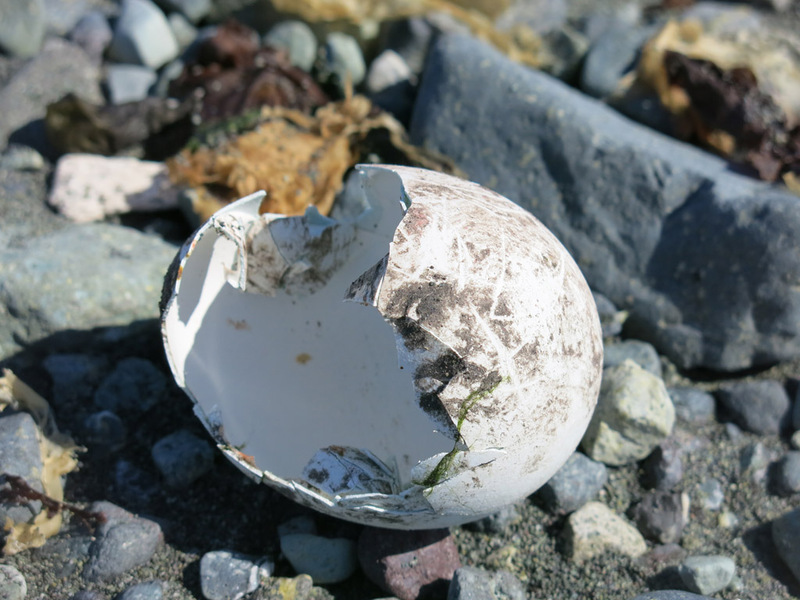 In our exploring we saw quite a few chicks as well, which is always a kick to see. 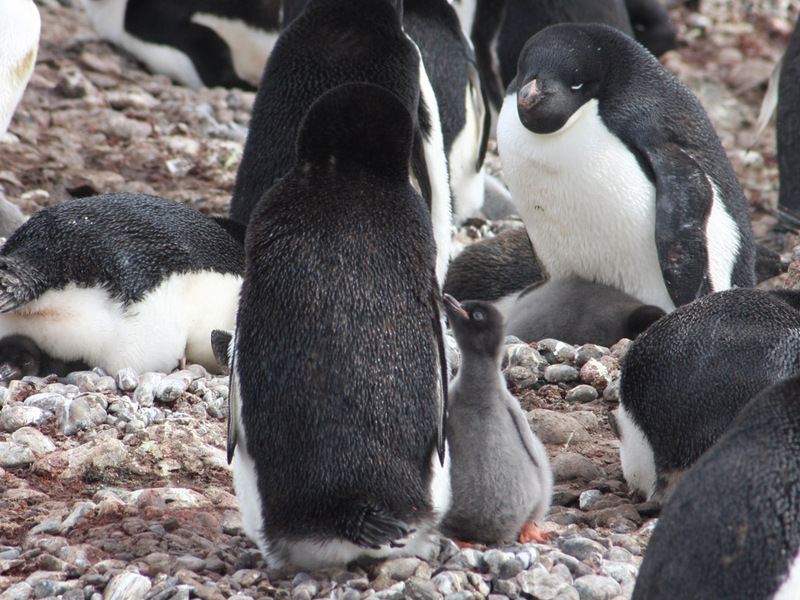 There also seemed to be quite a few adult penguin skeletons about which was very different to other areas we had visited. 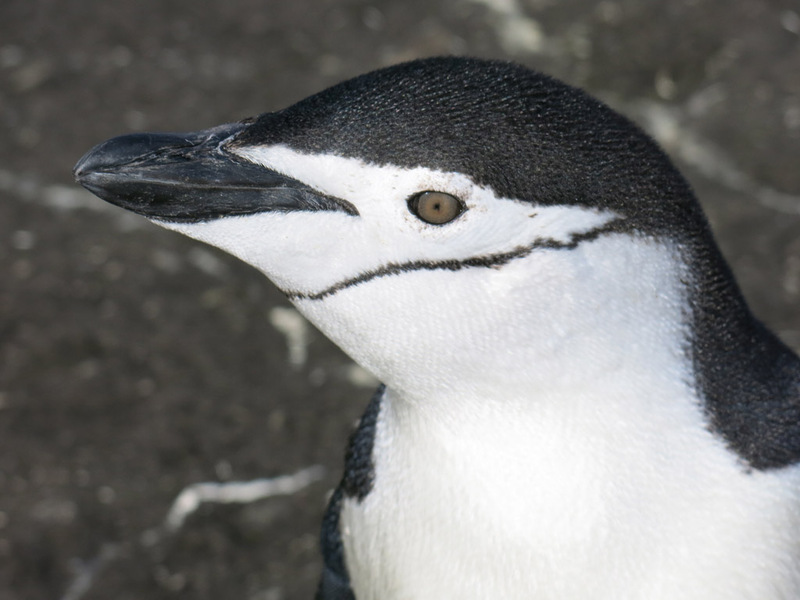 Lyn, our resident bird expert, could not explain it definitively, but told us it was unlikely due to attacks from other penguins or birds. We spent the last 20 minutes just sitting on the beach watching the penguins only a couple of feet away. Everyone was content. 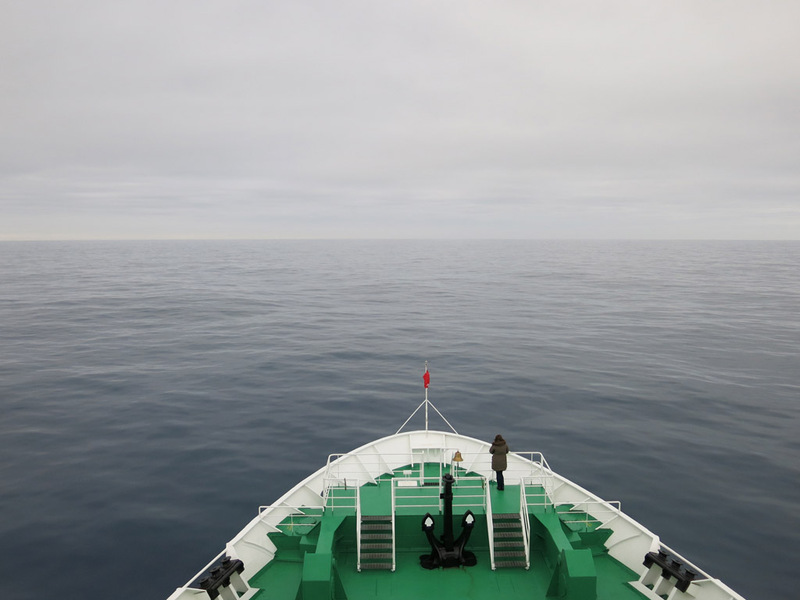 It was then time to get back to the ship and like the way in we had calm conditions. Once on board an announcement came over the PA that given the exceptional conditions, our captain wanted to take us on a small cruise into the volcano. Woo! So in we entered through Neptune’s Bellows inside the volcano. As you can guess Deception Island is the top ring of the volcano and there is a fairly narrow entry was that can be difficult to enter, but today all was fine. Once inside it was quite spectacular, with snowy peaks surrounding us all around. Inside there was also a couple of bases, and the remains of whaling ships of a couple of centuries ago. As well the rock formations were very different, again due to the volcanic nature of the area. We enjoyed a fairly leisurely cruise inside and then headed back out toward our next, and final, stop of the tour. 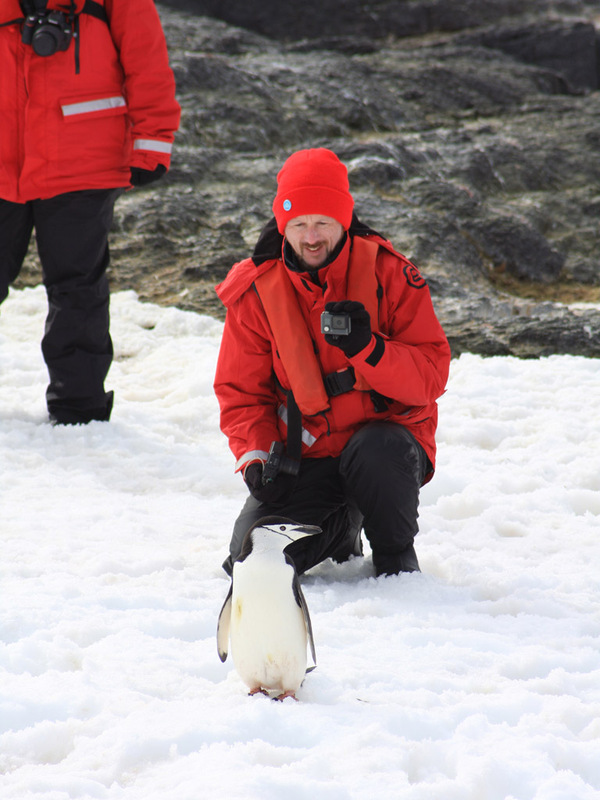 It was hard to believe we had almost spent our 8 days in Antarctica already. Final destination was Elephant Point, where we would be seeing yet another new animal believe it or not. 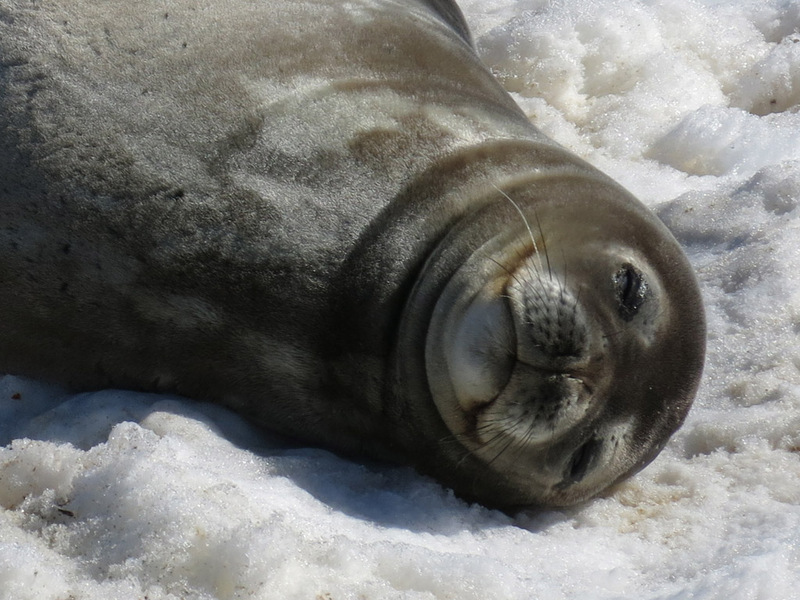 This time it was the big papa of seals, the Elephant Seal. 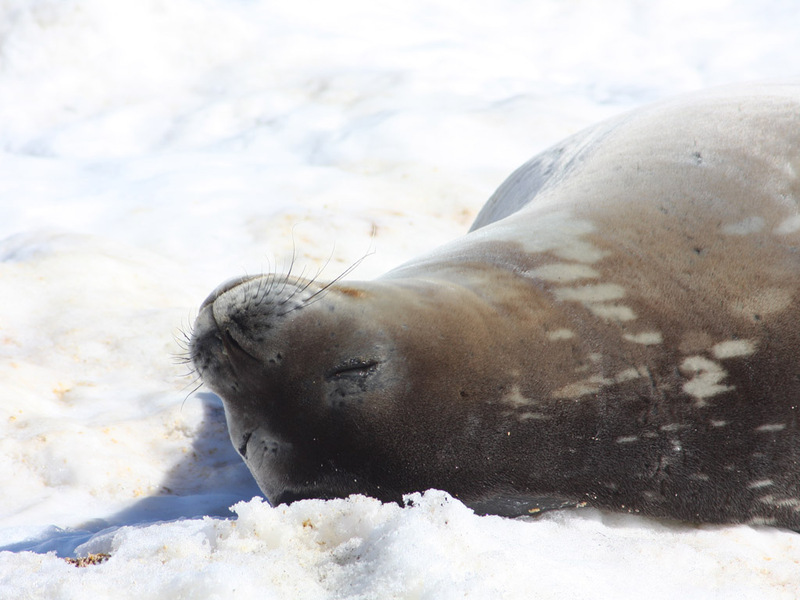 These bad boys can weigh a few tonne, and are also not the prettiest of seals, but it was exciting nonetheless. There was a feeling of melancholy in the air though, as it was to be the last shore landing for the trip and also when the kayak meeting was called and we had the go ahead, our last kayak session. This was going to make session number 9, which was the equal record for number of outings on this trip. Another indicator of the good fortune we had had. 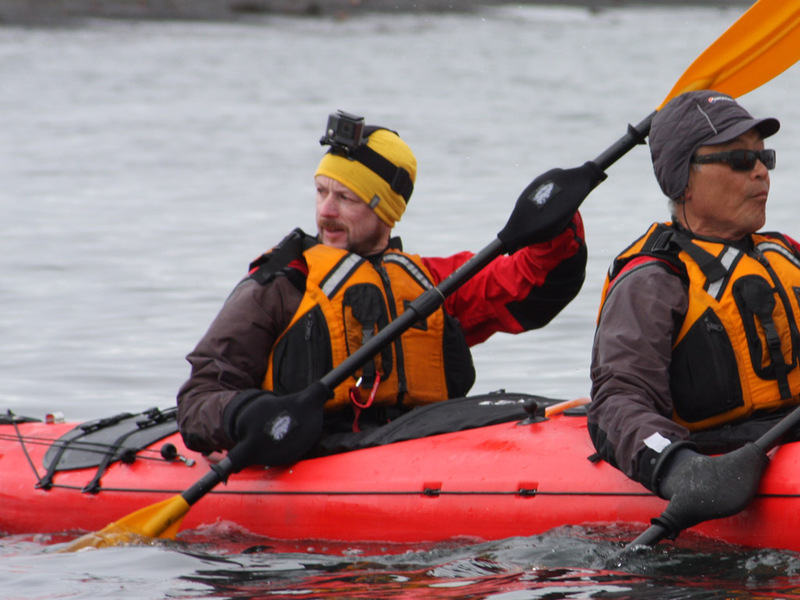 This kayak session was to paddle across the fair body of open water from the ship to the shore, and along the coast as much as the swells and rocks would allow, to get close to the seals. I was super up for it, especially as it was our last outing. 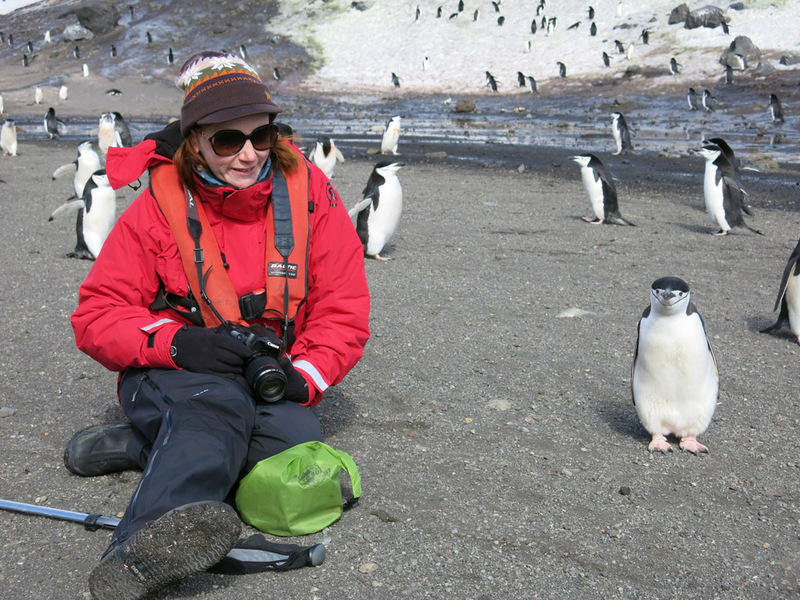 Kate was not sure, as she really wanted to get close to the new seals. She managed to secure a spot on a photo zodiac, so decided to head to shore. So we parted ways and I was paired up with Wucai again for the final paddle. In we went and the group headed toward the shore. As we approached we could see the big blubbering sausages on shore that were the Elephant seals. They looked so slovenly, just lying about, occasionally making some noise, or having a scratch. But they were mesmerising… and very smelly. 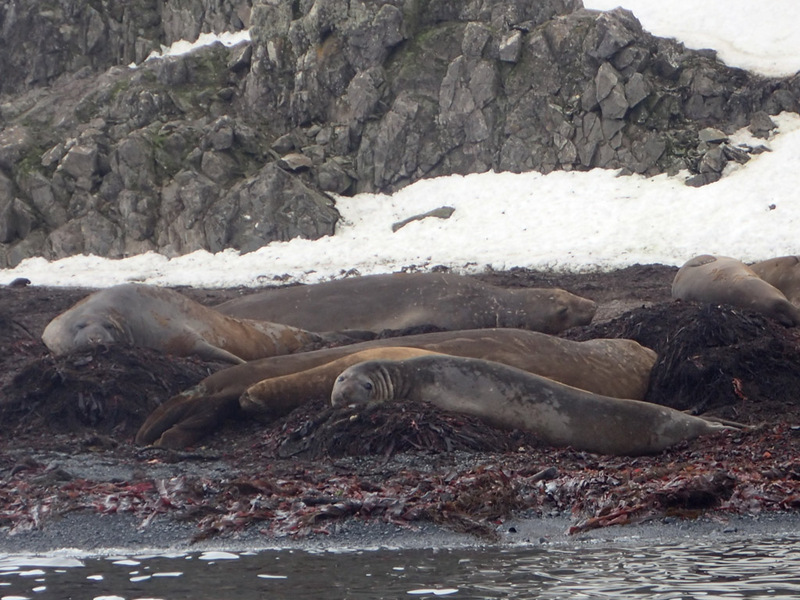 We continued to kayak around the coast, encountering many more seals (and Gentoos) as we went. It was tough as given the rocks and swells we had to be extra careful, but it was good fun. In no time at all a couple of hours had passed and we had gone quite a ways, much past the zodiac landings and all the other passengers. Between us and the ship was a lot of swelling open sea, but all we could do was put our heads down and start paddling. It wasn’t too bad in the end. We made it fairly comfortably, and I actually made it back into the mud room before Kate. It was a bit sad finishing up, and all us kayakers (the ones who did today were the ones who did the vast majority of outings) were a bit down that we were all done. But we had shared some pretty special experiences, so were buzzed about that. Kate’s trip was super eventful. 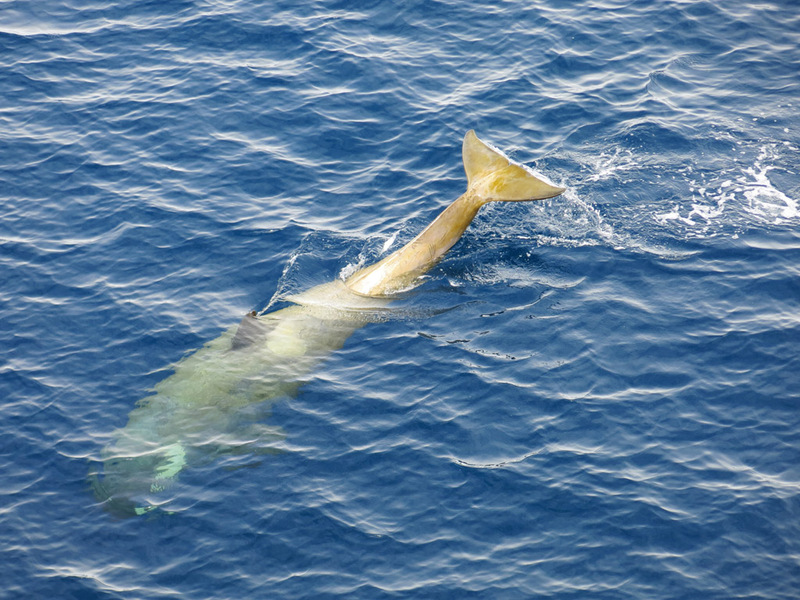 Being in the photo zodiac, she was fortunate to come across another whale in her travels, one that only her zodiac encountered. Our good fortune continued! 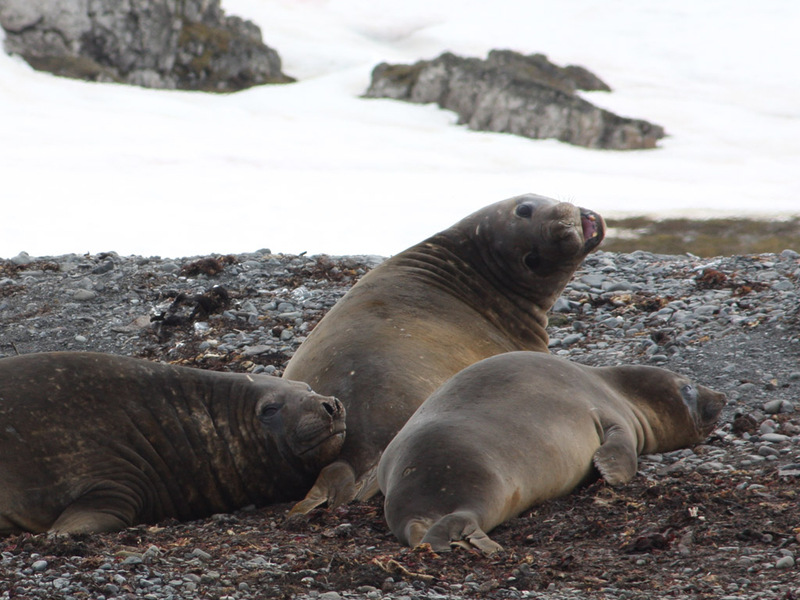 She also got the best pics of the numerous, pretty ugly, elephant seals hanging about. There were some cute pups though, so kind of the opposite of the ugly duckling story hey? The timetable seemed to be slipping a bit, and a bit later than scheduled, Jonathan did a quick talk on geology, starting universe, and getting to Antarctica. Man, does he know his stuff. What is most impressive is that he had been so amazing to this point with running the expedition, but he has an amazing knowledge of geology. The man is a marvel. From there it was straight into the final briefing, where again it was all a bit melancholy as the talk turned to wrap ups and talking about the end of the trip. With only Drakes Passage ahead of us, in many respects the trip is about done. There is two days left, but it would be some lectures and things to pass the time and keep people’s minds off the Drake. Kudos was given to all the crew and it was well deserved. The theme for the evening was black and white, and we were all encouraged to wear what we could. During dinner it seemed everyone had really settled into some smaller groups, Kate and I with some lovely folks from England, and some from Sydney. After dinner was a bit of fun, a fancy dress competition. It was great to see those that had put some effort into costumes. Sure, most were penguin themed, but everyone, especially the crew, was in the spirit. The winner was a rather crazy British lady dressed as quite an outlandish penguin. The whole boat was accustomed to her by this point and we expected nothing less. To see her win the comp was justice. The night wound up back in the Polar Bear bar, where a number of the Filipino crew had formed a makeshift band, the Monkey Eating Eagles. They banged out some enthusiastic classic cover songs and it was great to see the vast majority of the boat in there having a drink and some fun. We had to soak up the good vibes, as two days on the Drake awaited us. The next morning greeted us with a little bit of travel during breakfast before arriving at Kinnes Cove. 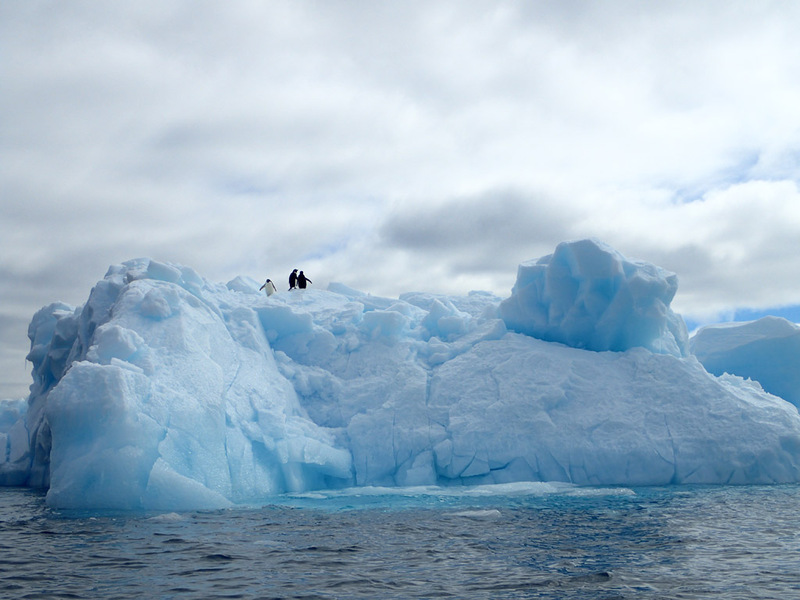 Like a lot of what we were seeing, brash ice was all about, as were the usual icebergs and penguins. 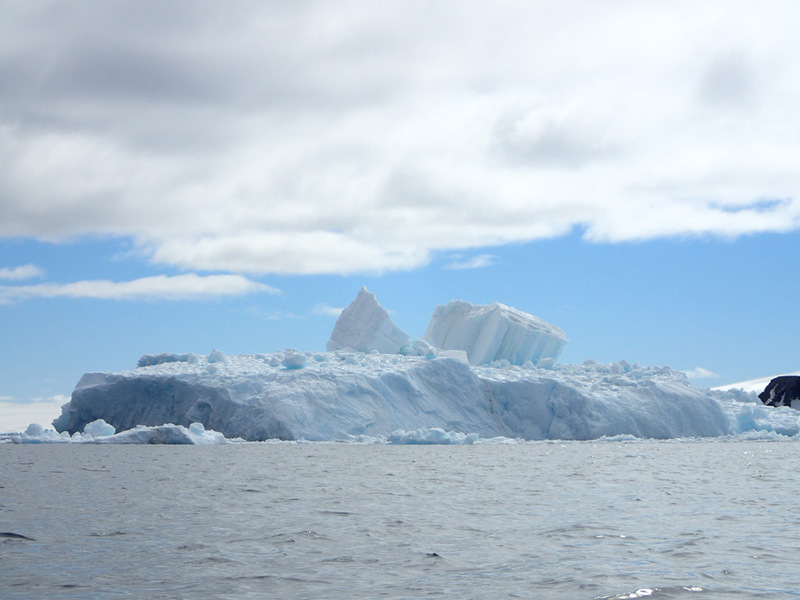 The overcast day was performing some magic on the icebergs, accentuating the magnificent blues in them which was a treat as we dropped anchor. 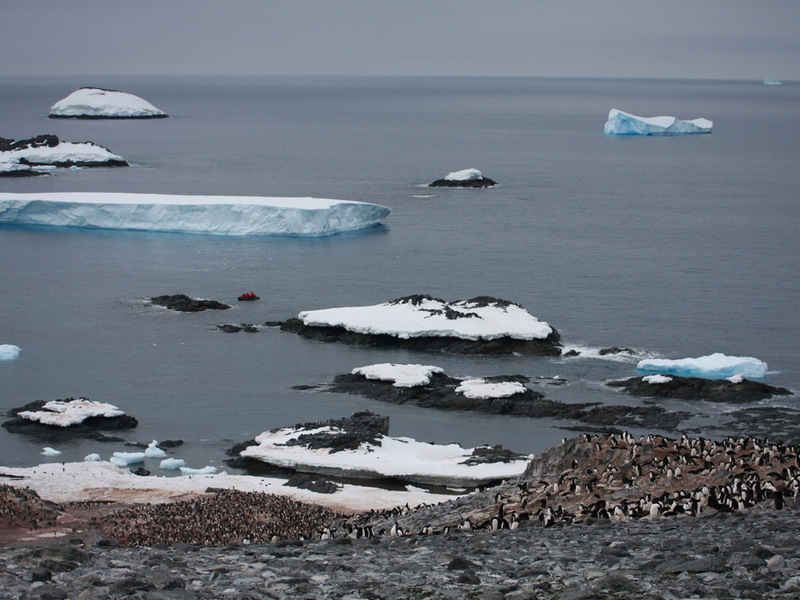 Kinnes Cove was home to the usual Gentoo and Adelie penguins, although there seemed to be the chance we would see some Chinstraps as well. Given I had only seen a couple of rogue ones about, it was a bit exciting. The morning kayak briefing was business as usual… conditions were good, there would be ice to battle, and we had a good 3 hours to spend on the water. So in no time it was back in the mud room and suited up. As we headed out the conditions were a little windier than we had had to that point. Not too bad, but a touch more challenging. 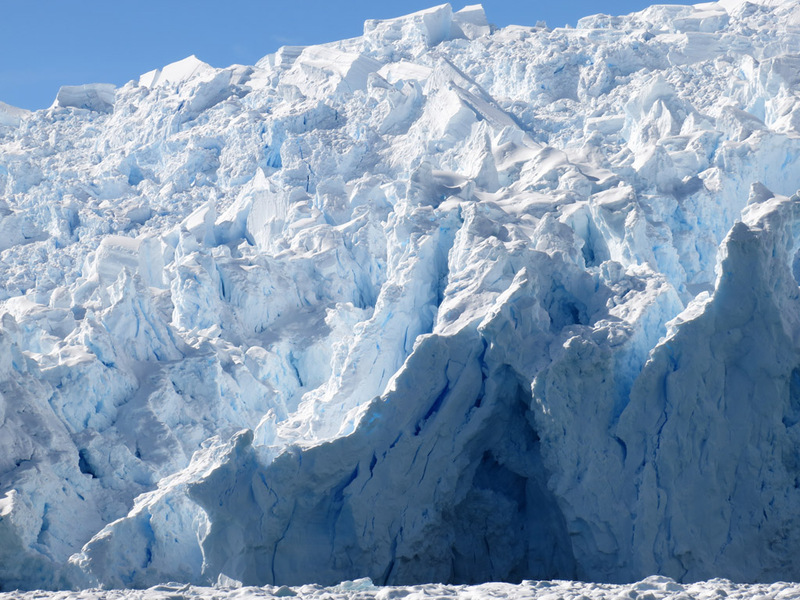 The kayaking was mostly getting about the ice and small icebergs that were in the cove. I tried popping the GoPro underwater to try and capture the amazing iceberg bottoms (and hopefully spot the odd penguin swimming about). 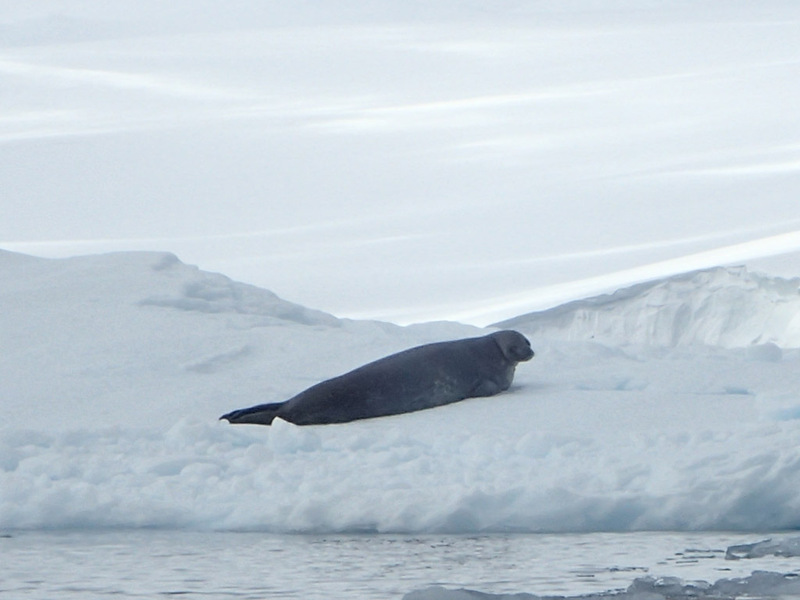 As we navigated about the ice, we came across penguins on icebergs, but also a Weddell seal with a young pup. 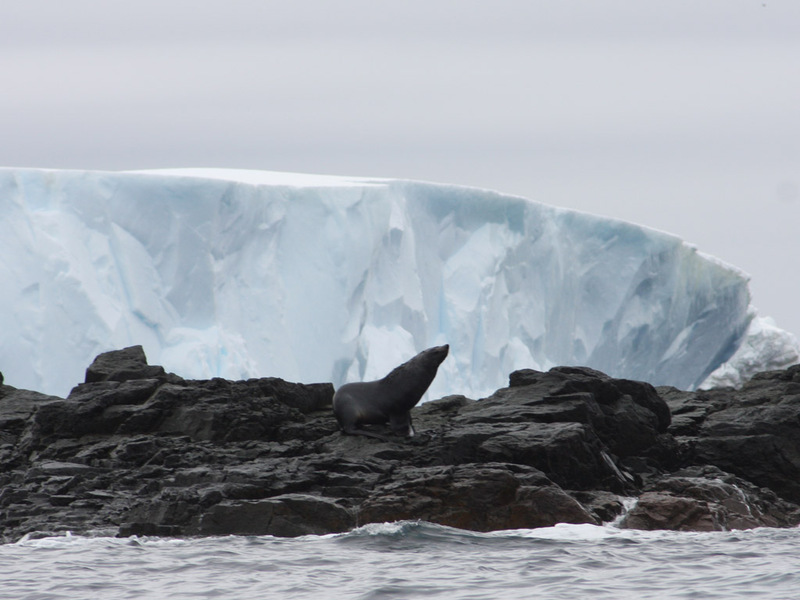 The pup was on the iceberg when we saw the mother pop up out of the water and on to the iceberg. They were a bit hidden so we couldn’t seem them too clearly, but it was nice to see a seal in action rather than just lounging on a beach. The rest of the kayaking time was pretty leisurely as we darted as close to the coast as we could get. 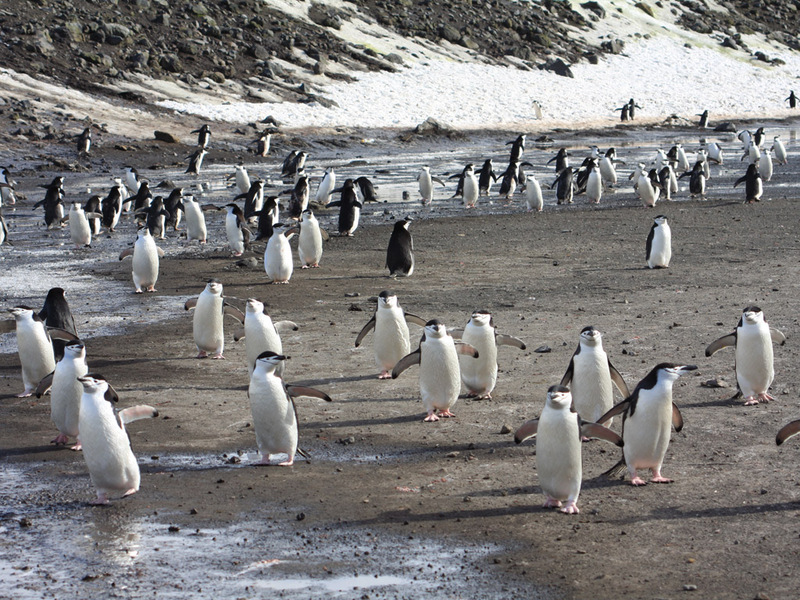 We got close to some penguin colonies, but alas we found only one Chinstrap surrounded by Gentoos and Adelies. Our collective of Chinstraps was still alluding us. We hit about two and half hours of kayaking when the wind turned around and found us a long way downwind of the ship. Mark made the call that we wouldn’t be able to get back to the ship in any reasonable time, so the zodiacs were called in to help. 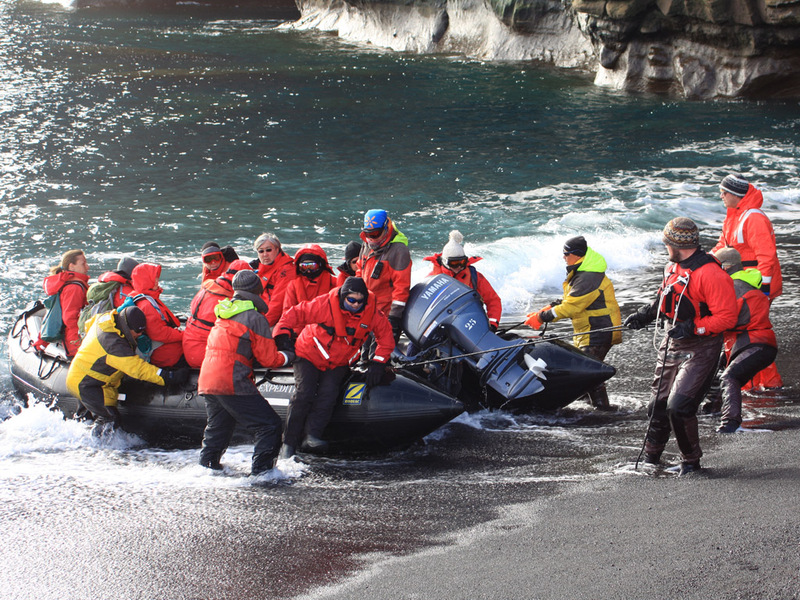 So excitingly we had to pull up alongside our zodiac, unpop the skirt, and clamber into the zodiac over the freezing waters. It was a pretty easy process in the end. With that we attached four kayaks to the back and zoomed to the ship. It was a bit precarious, as the ice caused havoc trying to keep the kayaks right way up. In fact our kayak (named Minke) overturned a couple of times but we were able to right it, get most the water out, and make it back. Lunch was ready for us (as always) and yet another big lunch led to a couple of hours of cruising to our next stop, Gourdin Island. 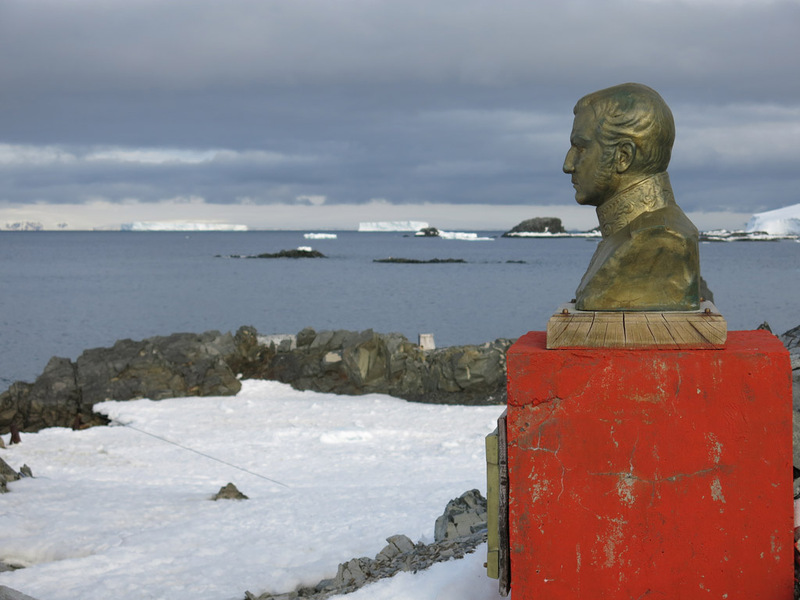 This was apparently one of the most difficult places to land in Antarctica, due to it being right near the entrance to Drake’s Passage and being notoriously horrible weather. But as we continued to ride our good luck we had great, albeit choppy, conditions meaning we could land. 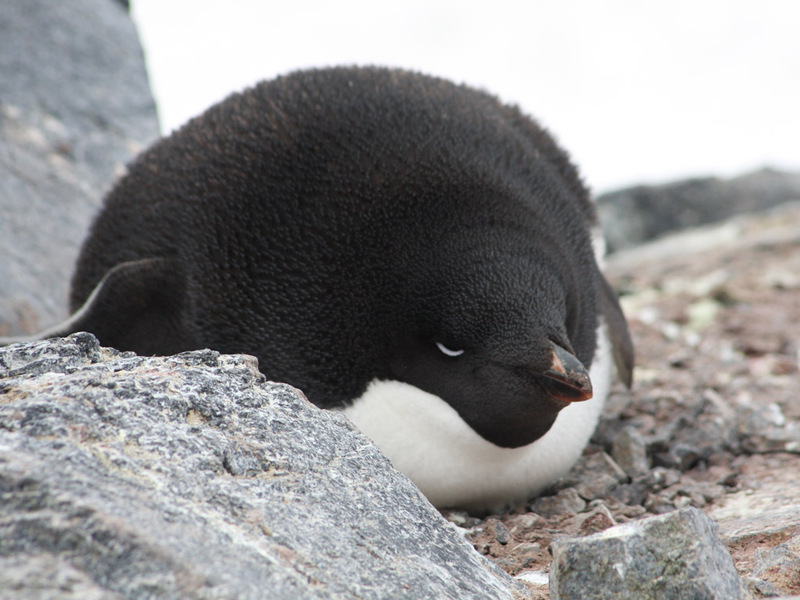 The attraction of Gourdin Island is that three types of penguin happily coexist: the Gentoos, Adelies, and also lots of Chinstraps. Woo hoo! We did have the option to kayak, however they were just going to be going on a short kayak around the island, and given the Chinstraps and the choppy waters, we decided to and on shore. We were so glad we did. 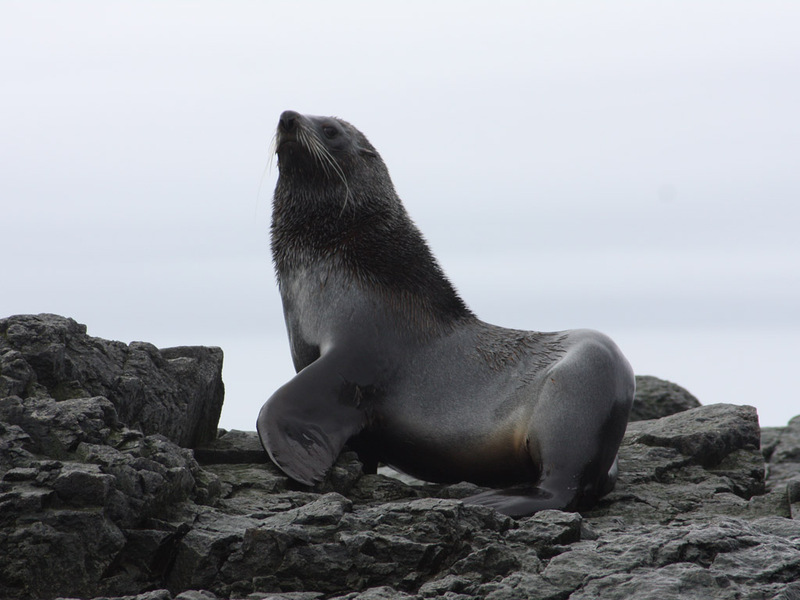 On the zodiac ride there we got to come face to face with a large Fur seal, happily showing off on a rock near the landing point. He was happy just to sit there and pose for photos. He did look majestic up there, that’s for sure. We then landed on shore and our decision was vindicated again. 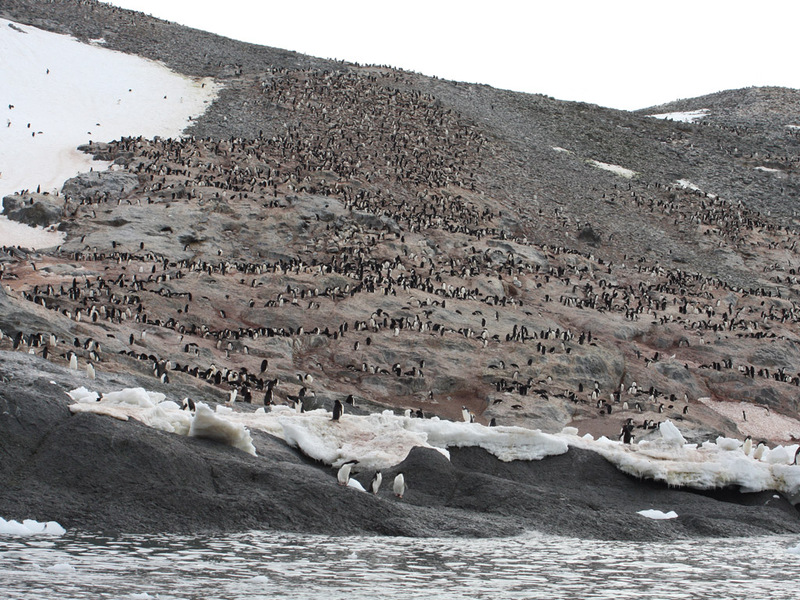 We immediately met thousands of Chinstraps, waiting for us on shore and up the side of the hill. These little guys all have the distinctive thin black stripe at the chin and are very striking. One little one was very curious of me and decided to come up close. I guess he was just saying hello. We made the trek up the hill and were surrounded by lots of Adelies and some Gentoos as well. 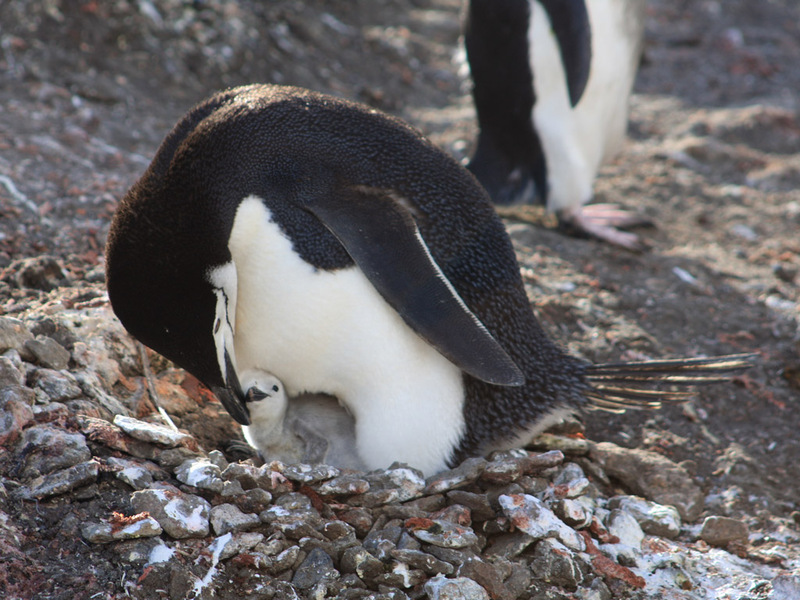 It seemed lots of chicks were out in the Adelies, and Kate managed to get heaps of great photos of the little ones. Jonathan gave the challenge to try and get one of each penguin in a photo, and on the way back to the shore, Kate spotted all three there together, like they had been set up. While they didn’t pose for the best photo, mission accomplished! With that we were back in the choppy waters to the boat. During the briefing we found out our southern most point, being 65 degrees 11 minutes latitude. 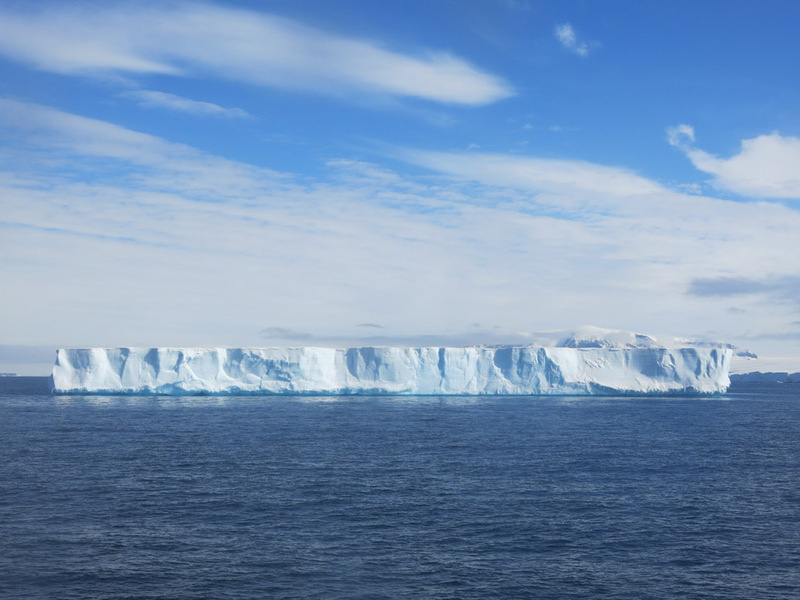 The Antarctic Circle is at 66 degrees 33 minutes, so we were about 150 miles off. Not that far, but given the ice we had seen, it really wasn’t going to happen. But as you can tell from our revised plans of the last couple of days, not a bad substitute hey?